Group of Cell Biology | Division of Biological Science, Graduate School of Science, Nagoya University. The emergence of multicellular organisms was an important evolutionary event that has led to the development of higher organisms. With this evolutionary jump, it became possible for cells to specialize functionally. Multicellular organisms are partially composed of organs, which are formed from different combinations of tissues, each of which comprises a group(s) of specialized/differentiated cells. Thus, an essential function of eukaryotic cells is cell adhesion, by which cells can combine to form tissues, and tissues in turn can combine to form organs. In general, there are two types of cell adhesion: cell-cell adhesion and cell-to-ECM (extracellular matrix) adhesion. Cells have developed special adhesion apparatuses to attach firmly to the ECM. One such apparatus is the hemidesmosome, which anchors the cytoskeleton on its cytoplasmic side and binds to the basement membrane on its extracellular side. The basement membrane is a sheet of 50-100 nm thickness, and is composed of various ECM proteins. Basement membranes exist at the borders of different tissues, compartmentalizing the tissues and providing cells with a foothold for adhesion. It has been suggested that basement membranes play important roles in cell differentiation, proliferation, and tumor metastasis. Our group has been working to clarify the molecular architecture of the hemidesmosome and basement membrane. The figure below shows immunofluorescence micrographs of cultured keratinocytes. 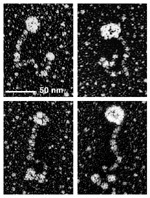 Keratinocytes (a) secrete laminin-332 (b), a component of basement membranes, thereby forming an extracellular structure. Immunofluorescence microscopy reveals that type XVII collagen (c), a hemidesmosomal transmembrane protein, is often found alongside laminin-332. Our electron microscopic studies have shown an interesting molecular configuration of type XVII collagen, shown in the second figure: the globular head in the cytoplasm indirectly connects to intermediate filaments, and the remaining rope-like portion attaches externally to the basement membrane. In addition to these molecular and cellular studies, we have begun to investigate the regulation and function of the hemidesmosomal adhesion system at the tissue level, using organotypic three-dimensional culture systems. Iwata, H. et al. (2009) J. Invest. Dermatol. 129:919-926. Uematsu, J. et al. (2005) Eur. J. Cell Biol. 84:407-415. Okumura, M. et al. (2002) J. Biol. Chem. 277: 6682-6687. Hirako, Y. et al. (1998) J. Biol. Chem. 273: 9711-9717. Hirako, Y. and Owaribe, K. (1998) Microsc. Res. Tech. 43: 207-217.